I have to admit that I haven’t fully explored the Fall 2011 collections that have been hitting the runways. Aside from the fact that I’m going head-first into midterm season (making my Vogue-reading and Style.com-perusing time rather minimal), the honest truth is that I’m so obsessed with the fun and colorful upcoming spring that I don’t really feel like thinking about fall yet. Forget the somber greys and heavy fabrics — I just want to wear a coral sundress already! 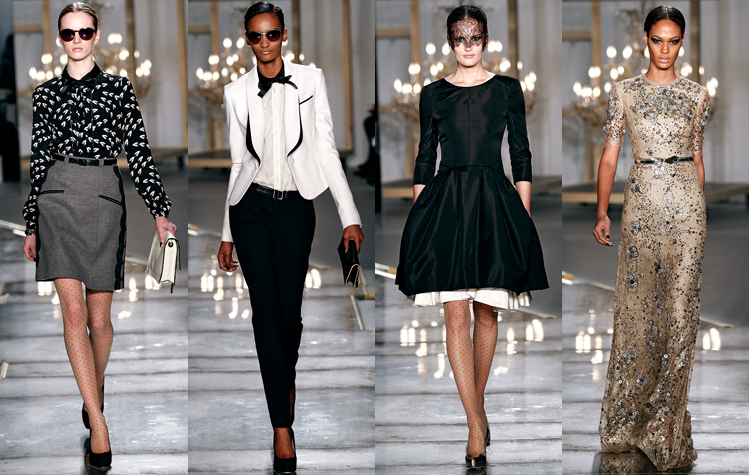 But when I got a peek at the Jason Wu prep photos from JAK & JIL I couldn’t stop myself from perusing the collection. Call it the Mad Men effect but I have been obsessed with all things prim and proper lately, and Jason Wu’s lace, high necklines and thin bow ties have me drooling. The printed blouses! The crisp, black-and-white blazer! The black 3/4-sleeve, A-line dress! The plumes! And oh my goodness, gracious — that gold embroidered gown. His collection wasn’t particularly innovative, but it was so well executed and cohesive. Feminine yet strong, the looks had a romantic flair but sportswear sensibility at the same time. Sometimes I feel like I’ve been out of the fashion loop and get overwhelmed thinking about catching up on what the trends are or the latest street style of editor X at magazine Y at fashion week Z. But the truth is, whenever I dive back into it, fashion never lets me down. Because at the bare minimum, it’s really nice to look at. And in actuality, it’s so much more. It’s about the empowerment of a strong shoulder, the femininity of a flowing dress or the confidence of a crisp white shirt. It’s why I keep Vogue, Elle and Marie Claire on tap for dreary days — because beautiful clothes light up my day and inspire me. Because thinking about the way a great outfit can make you feel is enough to make me want to dream up and share those outfits. And because everyone needs a study break, once in awhile.